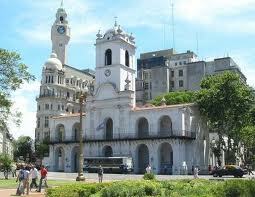 The story of Argentine independence was born in this white Colonial building. There, the Mayo Revolution was launched in 1810. 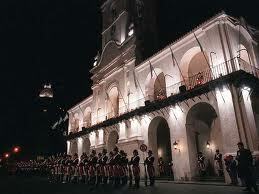 An interesting fact is that the Cabildo stands on the very spot Juan de Garay assigned it in 1580, when he founded Buenos Aires. The present building is not the original: the latter had adobe walls and straw roofs. After having its arches trimmed several times and many doubtful remodellings, architect Buschiazzo gave it its final appearance in 1940. Today, the May Revolution Museum functions here. On entering, three watercolours belonging to Carlos Pellegrini portray the Plaza de Mayo in 1829. Further ahead, several likenesses of the viceroys and antique furniture that belonged to our founding fathers are a throw-back to old school texts and history books. Dated chandeliers, medals, buttons, watches and coins are tangible traces that withstood time. The Sala Capitular (Chapter House) recreates faithfully the one where the First Government Gathering swore, on May 25 in 1810. Visiting the back patio is recommended in order to see two historical wells, one of them complete with its 1835 curb. Tuesday to Friday, 10.30 to 17; Sunday, 11.30 to 18. Guided tours, Sunday 16.30.